Grab Bar 30" x 33" Ht ; ADA Accessible Compartments Require: 1-1/2" diameter with concealed snap on flange 30" x 33"ht. 2nd leg sticks out 5" x 12"ht. Right hand shown, left hand is on opposite side. Toilet Grab Bar Wall Mounted ADA Accessible Compartments Require: 1-1/4" dia. bars, Exposed Mounting. Type 34 from American Specialties. Manufacture part number 3434 Straddle Grab Bar by American Specialties. Swing Up Grab Bar Locks firmly into place when lifted into an upright position. 1-1/4" OD. projects 30" from wall. When properly mounted, swing-up type bar will sustain a static load of 250 lbs. Used with ADA Grab Bars For concealed mounting to the flange and set screw. Grab Bar Mounting Plates Stainless Steel actual size is 2-11/16" diameter. Also known as D1512-98. The 12" Handicap Grab Bar is fabricated of #18 gauge stainless steel with a #4 satin finish. They are available in 1 1/4” and 1-1/2” outside diameter. All bars maintain a constant 1 1/2” offset, which is the distance between the inside of the bar and the mounting surface. The mounting flanges have a 3” diameter. We offer three types of mounting, exposed screw mounting, snap on flange concealed and set screw flange concealed. When properly installed they will easily support up to 250 pounds. The recommended height for mounting these grab bars is 33 to 36” above the finished floor, but heights vary depending on local codes. The overall length of the 12" grab bar is 15" due to the 3" diameter flanges. Due to the various materials that these are mounted on, screws are not included. The 16" Handicap Grab Bar is fabricated of #18 gauge stainless steel with a #4 satin finish. They are available in 1-1/4” and 1-1/2” outside diameter. All bars maintain a constant 1-1/2” offset, which is the distance between the inside of the bar and the mounting surface. The mounting flanges have a 3” diameter. We offer three types of mounting, exposed screw mounting, snap on flange concealed and set screw flange concealed. When properly installed they will easily support up to 250 pounds. The recommended height for mounting these grab bars is 33 to 36” above the finished floor, but heights vary depending on local codes. Due to the various materials that these are mounted on, screws are not included. The overall length of a 16” grab bar will be 19” due to the flanges. The 18" Handicap Grab Bar is fabricated of #18 gauge stainless steel with a #4 satin finish. They are available in 1-1/4” and 1-1/2” outside diameter. All bars maintain a constant 1-1/2” offset, which is the distance between the inside of the bar and the mounting surface. The mounting flanges have a 3” diameter. We offer three types of mounting, exposed screw mounting, snap on flange concealed and set screw flange concealed. When properly installed they will easily support up to 250 pounds. The recommended height for mounting these grab bars is 33 to 36” above the finished floor, but heights vary depending on local codes. Due to the various materials that these are mounted on, screws are not included. 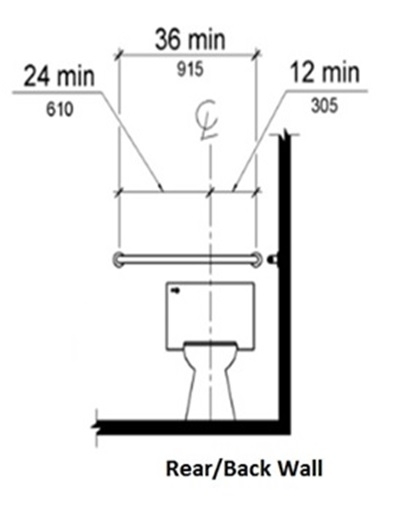 The overall length of a 18” grab bar will be 21” due to the flanges. The 24" Handicap Grab Bar is fabricated of #18 gauge stainless steel with a #4 satin finish. They are available in 1-1/4” and 1-1/2” outside diameter. All bars maintain a constant 1-1/2” offset, which is the distance between the inside of the bar and the mounting surface. The mounting flanges have a 3” diameter. We offer three types of mounting, exposed screw mounting, snap on flange concealed and set screw flange concealed. When properly installed they will easily support up to 250 pounds. The recommended height for mounting these grab bars is 33 to 36” above the finished floor, but heights vary depending on local codes. Due to the various materials that these are mounted on, screws are not included. The overall length of a 24” grab bar will be 27” due to the flanges. The 32" Handicap Grab Bar is fabricated of #18 gauge stainless steel with a #4 satin finish. They are available in 1-1/4” and 1-1/2” outside diameter. All bars maintain a constant 1-1/2” offset, which is the distance between the inside of the bar and the mounting surface. The mounting flanges have a 3” diameter. We offer three types of mounting, exposed screw mounting, snap on flange concealed and set screw flange concealed. When properly installed they will easily support up to 250 pounds. The recommended height for mounting these grab bars is 33 to 36” above the finished floor, but heights vary depending on local codes. Due to the various materials that these are mounted on, screws are not included. The overall length of a 32” grab bar will be 35” due to the flanges. The 36" Handicap Grab Bar is fabricated of #18 gauge stainless steel with a #4 satin finish. They are available in 1-1/4” and 1-1/2” outside diameter. All bars maintain a constant 1-1/2” offset, which is the distance between the inside of the bar and the mounting surface. The mounting flanges have a 3” diameter. We offer three types of mounting, exposed screw mounting, snap on flange concealed and set screw flange concealed. When properly installed they will easily support up to 250 pounds. The recommended height for mounting these grab bars is 33 to 36” above the finished floor, but heights vary depending on local codes. Due to the various materials that these are mounted on, screws are not included. The overall length of a 36” grab bar will be 39” due to the flanges. The 36" Grab Bar Center Post is fabricated of #18 gauge stainless steel with a #4 satin finish. The center post is right in the center of the grab bar and adds extra mounting strength. They are available in 1-1/4” and 1-1/2” outside diameter. All bars maintain a constant 1-1/2” offset, which is the distance between the inside of the bar and the mounting surface. The mounting flanges have a 3” diameter. We offer three types of mounting, exposed screw mounting, snap on flange concealed and set screw flange concealed. When properly installed they will easily support up to 250 pounds. The recommended height for mounting these grab bars is 33 to 36” above the finished floor, but heights vary depending on local codes. Due to the various materials that these are mounted on, screws are not included. The overall length of a 36” grab bar will be 39” due to the flanges. The 42" Handicap Grab Bar is fabricated of #18 gauge stainless steel with a #4 satin finish. They are available in 1-1/4” and 1-1/2” outside diameter. All bars maintain a constant 1-1/2” offset, which is the distance between the inside of the bar and the mounting surface. The mounting flanges have a 3” diameter. We offer three types of mounting, exposed screw mounting, snap on flange concealed and set screw flange concealed. When properly installed they will easily support up to 250 pounds. The recommended height for mounting these grab bars is 33 to 36” above the finished floor, but heights vary depending on local codes. Due to the various materials that these are mounted on, screws are not included. The overall length of a 42” grab bar will be 45” due to the flanges. The 42" Grab Bar Center Post is fabricated of #18 gauge stainless steel with a #4 satin finish. The center post is right in the center of the grab bar and adds extra mounting strength. They are available in 1-1/4” and 1-1/2” outside diameter. All bars maintain a constant 1-1/2” offset, which is the distance between the inside of the bar and the mounting surface. The mounting flanges have a 3” diameter. We offer three types of mounting, exposed screw mounting, snap on flange concealed and set screw flange concealed. When properly installed they will easily support up to 250 pounds. The recommended height for mounting these grab bars is 33 to 36” above the finished floor, but heights vary depending on local codes. Due to the various materials that these are mounted on, screws are not included. The overall length of a 42” grab bar will be 45” due to the flanges. The 48" Handicap Grab Bar is fabricated of #18 gauge stainless steel with a #4 satin finish. They are available in 1-1/4” and 1-1/2” outside diameter. All bars maintain a constant 1-1/2” offset, which is the distance between the inside of the bar and the mounting surface. The mounting flanges have a 3” diameter. We offer three types of mounting, exposed screw mounting, snap on flange concealed and set screw flange concealed. When properly installed they will easily support up to 250 pounds. The recommended height for mounting these grab bars is 33 to 36” above the finished floor, but heights vary depending on local codes. Due to the various materials that these are mounted on, screws are not included. The overall length of a 48” grab bar will be 51” due to the flanges. The 48" Grab Bar Center Post is fabricated of #18 gauge stainless steel with a #4 satin finish. The center post is right in the center of the grab bar and adds extra mounting strength. They are available in 1-1/4” and 1-1/2” outside diameter. All bars maintain a constant 1-1/2” offset, which is the distance between the inside of the bar and the mounting surface. The mounting flanges have a 3” diameter. We offer three types of mounting, exposed screw mounting, snap on flange concealed and set screw flange concealed. When properly installed they will easily support up to 250 pounds. The recommended height for mounting these grab bars is 33 to 36” above the finished floor, but heights vary depending on local codes. Due to the various materials that these are mounted on, screws are not included. 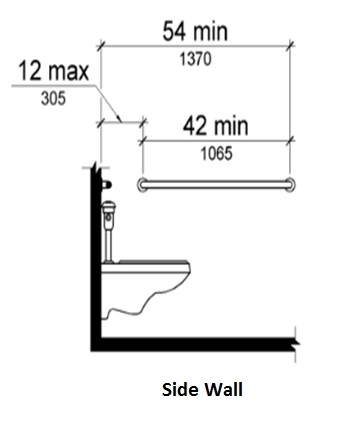 The overall length of a 48” grab bar will be 51” due to the flanges. Ada Grab Bar L 18" X 30"
Ada Grab Bar 36"L x 24"